Goldman Sachs’ claim that a Labour victory in the general election would impact negatively on Britain’s economy has been dismissed by leading British economists, who say the Wall Street giant’s outlook is laughable and colored by self-interest. In a research document sent to clients earlier this week, Goldman claimed a Labour-led government could spark an exodus of investors from the City of London to more business-friendly pastures. The bank’s warning adds to a growing chorus of concern emanating from the City that Ed Miliband’s party would formulate fiscal and economic policy in the interest of people rather than profit. Speaking to RT on Wednesday, British economist James Meadway argued Goldman Sachs' rationale was "nakedly self-interested.”He insisted the Wall Street giant is not a credible voice on economic policy. “Listening to Goldman Sachs for advice on how to run the economy is like listening to Dracula on how to run a blood bank,” Meadway said. Goldman Sachs is a powerful player in the City of London and across the European Union. However, the investment bank has been the focus of sharp criticism in recent years over allegations of insider trading, corruption, aggressive investment vehicles with corrosive social impacts, and its role in compounding Europe’s sovereign debt crisis. Despite the bank’s less-than-gleaming reputation, its condemnation of Labour will likely be welcomed by City financiers and Conservatives. Speaking to its clients earlier this week, the investment bank said a victory for Labour would be understood as“more problematic by the business community”than victory for the Tories. Goldman billed a coalition between Labour and the Scottish National Party (SNP) as the most toxic combination of parties that could enter government next month. 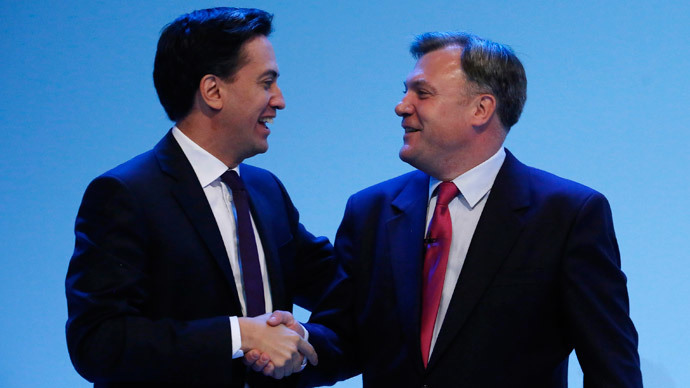 The bank warned Labour’s reliance on the SNP would drag Ed Miliband’s party out of its centrist position and further to the left. “Concerns are likely to emerge that reliance on the SNP would pull the Labour government away from the center to the left of the political spectrum, as well as raising the specter of distributional policies favoring Scotland at the expense of the UK as a whole,” the US bank said. “It is likely that market and business sentiment would be supported by the emergence of a Conservative government,” it added. The bank went on to claim that a series of “macroeconomic and financial shocks” will inevitably emerge in coming years, and that a Conservative-led government is the only credible option of carrying Britons safely through this inevitable economic turbulence. By contrast, the bank argued a Conservative-led coalition has established “some credibility” in markets in light of its “contribution to the stabilization of the economy” and “revival of growth” since 2010. Reflecting on Goldman's general election analysis, NEF's James Meadway said the Wall Street giant was lobbying for a pro-austerity government whose policies would benefit the interests of big banks. Amid “an explosion of zero hour contracts,” profits are at “record levels” and the stock market “has never looked rosier,” he added. Meadway accused Goldman of selling the very “financial time bombs” that helped create the crash, and then reaping mammoth profits by betting on the resultant crisis. “The recession was so bad and the bank bailout so extraordinarily expensive precisely because we have had governments - including those before Labour - that let bankers and speculators run riot for decades,” he said. Echoing Meadway, he said the bank’s role in creating the global financial crisis should not be forgotten. “Like all the other Wall Street firms, Goldman had to be bailed out by the US and British governments from a financial crisis that Wall Street caused,” he said. Burke suggested Goldman's“moans about zero-hours contracts and a modest cap on energy bills”are a strategic diversion. “This is because their real aim is to avoid 50p tax rates for high earners, the Mansion Tax and other small impositions which shift some of the burden of austerity onto the shoulders of the rich, the likes of Goldman Sachs bankers and their clients,” he said. Goldman’s analysis of Labour, the SNP and the Conservatives is widely viewed as ideological, born of a firm commitment to an economic system that favors austerity, light touch regulation, market liberalization and privatization. The bank’s prognosis follows similar rhetoric from Credit Suisse and Panmure Gordon, which have warned of the dangers of a Labour-SNP coalition for market volatility. Labour has strongly rejected the critique of Goldman Sachs and other City players. "Labour is pro-business, but not business as usual," a spokesman for the party told RT on Wednesday. "We want more competition in banking, a British Investment Bank to boost lending and action to tackle tax avoidance.Financial services are an important part of our economy and the big threat to the City and our economy is a re-elected Tory government taking Britain out of the EU."